FRANZ KROMMER (1759-1831): Symphonies No. 1 in F, Op. 12, No. 2 in D, Op. 40 & No. 3 in D, Op. 62. Description: These are all big-boned, thematically memorable, late Classical symphonies a la late Haydn (they date from 1797, 1803 and 1807) which are performed with the vigor, cut and thrust of a period instrument band although it’s a modern-instrument orchestra (think Marriner and the ASMF and remember how wonderful Griffiths’ Ries cycle was!). 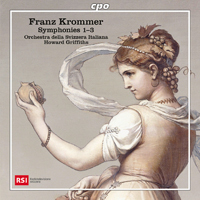 Krommer wrote nine symphonies and you will certainly want to hear the rest in order to find out how close he came to early Romanticism in Nos. 5-9 which were written in the decade of 1820-30; only one more, the Fourth, was published and No. 8 is lost but the manuscripts of the other three exist! Matthias Bamert did Nos. 2 and 4 for Chandos almost 23 years ago but 1 and 3 appear to be first recordings. Orchestra della Svizzera italiana; Howard Griffiths.